Fuller's pub on the corner of Katharine Street and the High Street. 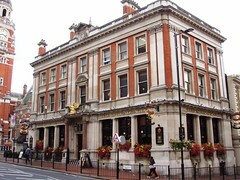 The pub is a conversion from an old bank building; see a photo of it as the National Provincial Bank in 1970 (towards the right of the photo). Last edited 2019-01-28 14:00:16 (version 31; diff). List all versions. Page last edited 2019-01-28 14:00:16 (version 31).